Home › Computer Terms › What Is Ready Boost? Ready Boost is a feature on Windows 7 and Windows Vista that allows external memory to be used to improve system performance. Ready Boost can take advantage of USB storage devices, SD cards, or CompactFlash cards. Windows 7 can take advantage of up to 8 devices using Ready Boost. It also can make use of up to 256GB for additional memory use. Windows Vista can make use of up to 4GB. However, Microsoft states that Ready Boost uses a 2:1 compression ratio. This means that 2GB of memory could potentially hold 4GB of data. When a computer needs to access data it looks for the information in the cache, RAM, and hard drive. If the data is not in the cache it looks in the RAM. If the data is not stored in the RAM it looks in the hard drive. Depending on where the data is located this can take up valuable processing time. Slow computers are a great example of this. The most likely reason for a slow computer is low system memory. The computer no longer can access new data out of the RAM because it is full of open processes and data. The computer slows down as it searches through the hard drive. Using flash memory to speed up a computer is a great way to improve system performance without having to buy new hardware. Ready Boost allows users to allocate flash memory for more cache. Cache is the fastest memory a computer can use to access data. Increasing the cache allows more data to be stored for quicker access. How does Ready Boost actually work? Ready Boost takes flash memory or any flash mass storage system and treats it as an additional memory cache. Ready Boost compresses data and also encrypts it using AES-128. All of the data placed on the flash memory is encrypted like this. When the computer looks for data that is not on the L1 or L2 cache it then looks to the RAM. If it does not find it in the RAM it will then look in the Ready Boost devices. This is much faster than accessing information from the hard drive. To start Ready Boost, insert a Ready Boost compatible flash storage device into the computer. 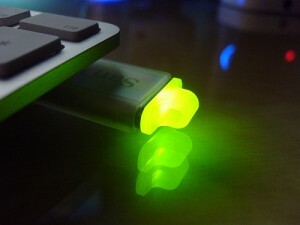 Compatible devices are USB flash drives or any flash mass storage device. Windows AutoPlay will recognize the device and provide the choice to use the flash drive to improve system performance. Make sure that the flash memory has at least 256MB of memory or Ready Boost cannot use it. The memory must also have an access time of 1ms or less. Any memory used should also have the capability of 2.5MB/s read speed and 1.75MB/s write speeds. Grab an old flash drive and get some free computer maintenance using Ready Boost.